Gymsupply.com / DGS-9.9’s your full-service gymnastics supply company. Gymsupply.com is owned by Deary Bros. Inc. Doing business as Deary's Gymnastics Supply and DGS-9.9’s. Gymsupply/DGS-9.9’s opened its doors in 1993. 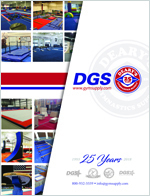 Brothers Peter and John Deary formed a small regional gymnastics supply company servicing gymnastics clubs, public schools and universities, YMCA and other gymnastics programs in need of equipment, mats and facility services. The company provides service and support for all gymnastics supply needs, including gymnastics equipment, mats, training aids, trainers’ medical supplies and chalk for use in the gym. DGS also offers general merchandise for resale in pro shops. In 1995 the company expanded nationally with a catalog to sell mail-order, home-use gymnastics equipment and commodity gymnastics products, directly to athletes. Items include gymnastics grips, wrist and ankle supports, apparel, jewelry, and a host of fun general merchandise specific to gymnastics. Gymsupply.com / DGS-9.9’s has grown to become one of the largest gymnastics supply companies in the USA through tremendous customer service, quick delivery, and quality products. In 2006 DGS 9.9’s become the official grip supplier to the USA Gymnastics Men’s and Women’s national teams. Along with a fully trained staff of Gymnastics facility designers DGS also operates a full manufacturing facility with upholstery, woodworking and metalworking shop. With new modern manufacturing equipment we produce custom protective pads, gymnastics and cheerleading spring floors, home use balance beams and many new strength and fitness products built specifically for the world of gymnastics. Many employees of Gymsupply.com DGS 9.9’s are former gymnasts and cheerleaders. We understand how hard our customers work to achieve excellence in the sport of gymnastics. We strive to achieve the same excellence in customer service that our customers achieve in gymnastics. We continue to visit gyms, gymnastics events, and championships each year to keep our finger on the pulse of the gymnastics world. We're proud of our commitment to support the growth of the sport gymnastics through product development, customer service, and the many ways the gymnastics community asks for our help.